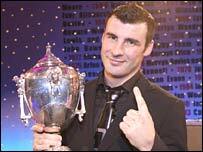 World boxing champion Joe Calzaghe has been crowned BBC Wales Sports Personality of the Year for 2006. Undefeated Calzaghe, 34, added the IBF world super middleweight belt to his WBO belt this year and was named the British Boxer of the Year. He beat Nicole Cooke, Ryan Giggs, Bradley Dredge, David Davies and Michaela Breeze in a public vote. 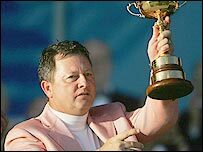 Winning Ryder Cup captain Ian Woosnam won the merit award for outstanding contribution to Welsh sport. Footballer Gareth Bale and golfer Breanne Loucks won the Carwyn James youngster awards at the prestigious ceremony at the Celtic Manor Resort. Bale, 17, became the youngest Wales international when he made his debut against Trinidad and Tobago in May aged 16 years and 315 days. And his superb goal in the 5-1 defeat to Slovakia in October then made him the youngest player to score for Wales. Loucks, 18, won all three of her matches for the Great Britain and Ireland team in this year's Curtis Cup. Wales' Commonwealth Games team won the Team of the Year award for returning with 19 medals from Melbourne. The Unsung Hero Award went to Mandy Keating Georgetown Boys & Girls Football Club, near Merthyr Tydfil. Calzaghe cemented his position as the world's best super middleweight by delivering a masterclass of boxing in comprehensively beating American Jeff Lacy in March to claim the IBF title. The victory finally brought long-overdue acclaim and respect from the previously unconvinced US boxing media. Calzaghe then defended his WBO belt for the 19th time with a unanimous points victory over Sakio Bika. "It feels good to win again," said Calzaghe. "I won it in 2001, but now it's voted by the general public it feels even more special to win. "I'm getting on, I'm 34 years old, and to win it again is fantastic. "A big thanks to my dad [trainer Enzo] who's been with me from the start. I've been waiting for years for this so-called career defining fight against Jeff Lacy. "It's been a fantastic year for me and a great year for Welsh boxing." Woosnam was presented with his award by Darren Clarke, one of Europe's heroes in September's Ryder Cup win over the United States at the K Club, near Dublin. "It's nice to have this award and for Darren to present it to me," said the 48-year-old former US Masters champion. "Let's make sure we win the Ryder Cup again in Wales in 2010."